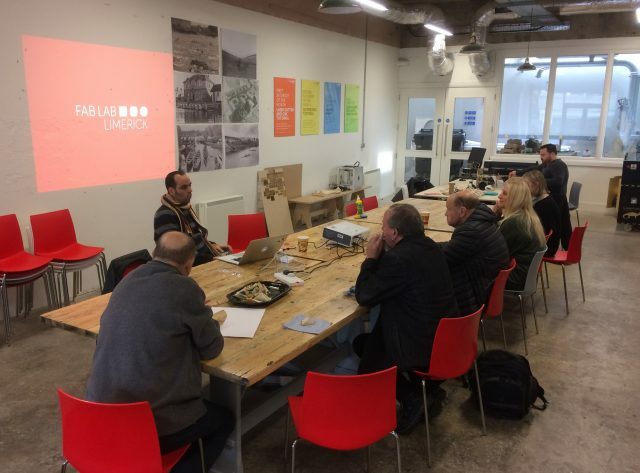 Another Design Skills Course is currently running at Creative Spark in Dundalk and on Thursday and Friday the class visited Fablab Limerick to get a tour of the spaces and use the machinery. Thanks to Javi and Ger for their presentation and the use of the machines including the impressive ‘Wasp’ Delta 3D printer which is capable of taking a ceramic extruder and building large sized prints. Their ‘Formlabs’ printer also impressed us with the quality high res prints from liquid resin. The Trotec laser was put to good use and even the Shopbot CNC was used to cut some test structures for an educational tool. Having a full digital fabrication tool kit available at the flick of a switch really enables fast idea interation and multiple modifications to be done almost instantly. I was particularly impressed with the new storage wall in CNC cut Birch Ply for the machine room. If you are in the Limerick area definitely check out the Fablab opposite the Hunt museum.